I understand how you must feel about that costume. I watched my mother battle with similar problems. Alzheimer’s is a terrible disease. It robs you of your life long before your time. Bella! Long time no see! Are you feeling better? I hope so. I’m so glad you liked my post. If I had the time, I would certainly write more family stories. But, as you can imagine, these take more time to do. I cannot tell you how many versions I went through before I finally finished. And the whole time I was thinking, no one’s going to care about my mother’s sewing machine. What I totally forgot was that if I’m from a generation that had a mother who sewed, I probably wasn’t the only one. So I love how my story has triggered the memories of so many others. This is truly what writing is about. Sometimes I think about giving up and throwing in the “writing” towel. But then something like this happens, and it makes me feel good that I could help someone else remember their family history. Not sure if this makes sense, but it’s what I feel. My love to you and Roxy! We are losing skills like sewing and crocheting. One day we may all wish we had a little of your mother’s talent. Love the pic of you in the holiday dress. Nice! Renee, I agree. But some of us just don’t have the head for it. I actually once tried to learn to knit and I was a disaster at that too. On the other hand, my daughter crochets and sometimes knits. Now, she’s got the knack. I truly believe you need patience for it. Something I don’t have. Sigh. I Love that dress! It is still a classic. I’d wear it now. Monica, I could hear the machine while reading this.. You have to submit this somewhere – it’s life. You’ve captured a memory on the page and turned it into something vivid an alive. I have letters that my father wrote to me during his last months. Like your unopened sewing machine, so are my letters. It’s silly, we’re much braver that we give ourselves credit for. Beautifully written. I remember your post about your father’s letters, and I think I told you to read them. How ironic, that we’re both in the same boat. Bring your letters over and I’ll read them aloud to you while you open my mother’s box. Sound good? My mother did not sew . . . but I did. In fact, a sewing machine was the first big purchase of mine as a teenager. I LOVED sewing, and saved up for one. And I made some pretty spiffy things. I actually still have that machine and have spent many glorious hours making things for my daughter when she was young. My ‘piece de resistance’ was an American Girl outfit that matched her doll’s. I love how your mother’s sewing machine becomes a thread (couldn’t resist that) for the loving memories. Deborah, sewing is an art, one I wish I had been able to learn. But I really don’t have the head for it. Or maybe it’s the patience to do it right. So I’m very impressed that you know how to sew. I wish I’d been able to use my mother’s sewing machine myself. I sometimes think if I had been able to sew, using her machine would have been the right thing to do. A wonderful memory Monica – beautifully described. Oh, Monica, I’m so sorry to be late getting here. But, I swear, my dear, this may be the most lovely and moving piece I’ve ever read of yours. It hums like your mother’s sewing machine itself. Such powerful and deeply textured writing. Your heart and that of your mother’s sing in every sentence, my friend. And, by the way, I have NO intension of not blogging. In fact, a move to Ecuador will be all the more reason to write! Oh, Kathy! Your words are music to my ears! I’m pleased you liked my post and I’m thrilled you’re not leaving the blogosphere. I value you and your work so much, so this is really great news. Hope you sell your home soon! Have a great, productive weekend, my friend. You share your memories so beautifully in a way that touches us all. My mother also would sew clothes for my brothers and me. Of course theirs were matching – little boy suits with shorts. And my dresses always had flowers on them. So I decided that I too had to sew for my children, but i only made Halloween costumes. Nothing like your mama’s Ninja turtle! Once my daughter was a kitty with one ear on top of her head and the other on the side near her chin. I refused to buy the store bought costumes that all the other kids would have, and I think my children will never forgive me. But I hope someday they will laugh and tell their children how they had to wear these crazy halloween costumes sewn by their mother, they wear not beautiful but certainly made with love. What a sad, yet sweet story. I could imagine all of this. My grandmother passed with Alzheimers some time ago. Dimentia and that are so debilitating. Thanks for sharing that memory. I hope writing this made you feel better. You should submit this story. My mother’s dementia soon turned into Alzheimer’s. It was before there was any medicines available to delay it. It was before they could officially diagnose it. In fact, we had to wait for the autopsy to know for sure (what I’d suspected all along). Alzheimer’s. Such a scary disease. Submit? Do you have any suggestions? This is just lovely! Your mom was very talented! Yes, she was! Glad you liked my story! Monica, this is truly one of the most touching bits of writing and I had tears all the way through because it brought me in touch with my past, too, and all the “water-color memories” that still color all of our lives into a rich tapestry. I also love Robert’s Post and I urge you to follow his suggestion. Sometime after my mother died three Christmasses ago, one of my sisters discovered a 26-page letter she wrote to our father (her husband, of course), and afterwards put it into a drawer and there it stayed for almost 40 years until its discovery. In the letter she describe all the memories of their decades together, the joys,the love they share, all the way to his cancer, his treatment, the doctors, and final days, and the heartbreak she felt. My sister made copies for me and my other sister, and I cried all the way through. One sister wasn’t able to read it and the other did right away and also cried. Even though gripping, I was glad I read it, and Robert’s suggestion is beautiful, and you can find out, too Your post was so charged with meaning I sent it to so very many many people. Thank you, thank you, Karen, for sharing my story with so many. I love that you did. And thanks for sharing your story. No matter how old we are, we still miss our mothers. That costume is AWESOME! I can see why you kept it. I know, right? I was totally amazed when it arrived in the mail. Wasn’t expecting anything this elaborate at all. Ah the coordinated dresses! 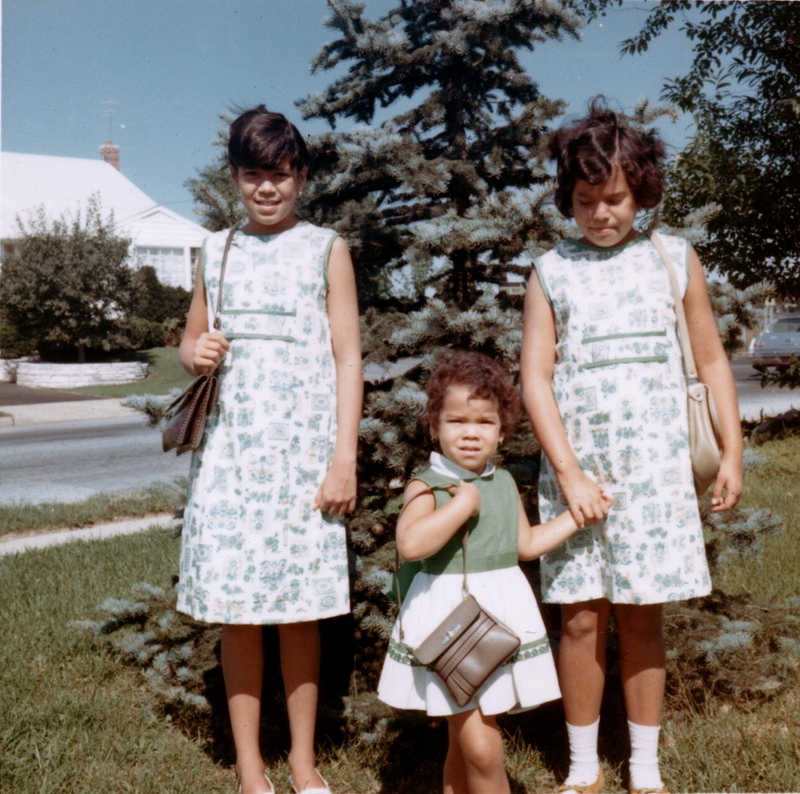 You’ve inspired me to find photo’s of me & my siblings in the matching outfits. This is such a great post! It’s so nice to go through your memories with you. Would have loved to have met your mom. Trisha, I’d love to see your photos of matching outfits. And yes, I wish you could’ve met my mother. She was so nice and shy. In other words, total opposite of me. I never called her Mom though. It was always, Mama. Monica, your post today SINGS!! It’s a lovely tribute to your persistent mother and the love you two shared. You were lucky to live “abroad” for a year, though I’m sure you must not have thought so at the time — to be immersed in your heritage at such an impressionable age, when you were like a sponge and able to soak up the language and culture! I know you wrote this amid tears; it’s obvious because the emotions really come through. Thank you for sharing such special memories and letting us know you better! Debbie, you’re so right about me not feeling so lucky. At first I was excited by it. But soon, I started feeling horrible, missing my mother and even my brothers, who I used to fight with all the time. I learned a new way of life and I learned how to speak Spanish. But the pain of being separated from my family never quite went away. There are some memories that are best to just leave them be. I’m sitting on my deck reading your story and the emotion that pours from it. I opened a box recently with cards and letters written to me or my kids by her. I’m still organizing my home we moved to last June and the space is limited. There are things I’ve learned to let go of but not these items. We move or our parents move but there is always something that keeps the memory of our closeness continue. Thank you for sharing this wonderful story. Mary Lisa, I so agree. There are some things too hard to let go for the memories they evoke, for the love they reflect. Thanks for reading and sharing your comments! All the things everyone else has said, this is a really beautiful post a lovely tribute to your mother. I enjoyed reading it and it brought back memories of my own mother sewing. Those gifts are precious and it’s good to remember. Thanks so much, Lisa. I agree. It’s having the memories that gives one comfort, and I’m so grateful for mine. What a lovely tribute to your mother. My grandmother and mother made most of my clothes when I was a little girl. I wish I still had some of those dresses. I do have my grandmother’s Singer, but I can barely sew a straight stitch, so it sits in my laundry room. Just in case. The other women in my family all sew, so they have fancy new machines, but I’m content with Grandma’s. Shary, it’s ironic I ended up with the sewing machine. I wanted it so much, but, like you, I can’t sew either. Thanks for sharing your memories. This is a beautiful post, rich in texture and detail, but most all, emotion. It captures the essence of your relationship and touches on the broader world of mother-daughters. My mom sewed for me too–everything from comforters to clothes, and I know it gave her great pride and joy to create these things. She also crocheted. I still have a a blanket she made when I was 8 years old. Now it sits on my daughter’s bed, and every once in a while it inspires her to say , “Tell more about your mom,” which launches me into wonderful rambling memories of the person I loved so much. Becky, how wonderful that you can share your memories with your daughter. My daughter was too young to remember my mother, but I keep framed photos of my mother throughout the house, and that is how my children came to know her. It gladdens my heart to know that so many of us have memories of our mothers sewing. As for me, I can barely sew on a button! Monica, this post spoke to me like no other. You are a true beauty, look at you at age 15. Your life will always be rich with memories, blessed because you can relive them, smile and cry. My mother too has this kind of sewing machine, still. In the era of electronic machines, she does not want to part with hers and when I visit her, I watch her at it. She has sewn many dresses for me and my dolls, in fact for home ec. one time, she sewed my pillowcase – a project I refused to do because I just could not sew. She is brilliant at it. I now wish I had learned properly. My memories of her sewing machine and the clothes she made for me are so precious, I wish I could bottle them. I understand how difficult it is to open that box, filled with memories, the smells and the very essence of your mother which will overpower you with sadness. There will come a day when you can. My heart breaks evey time I think of how far away I am from my mother. It never fails to bring me to tears. MM, your story sounds a lot like mine. I couldn’t sew either. Don’t have the head for it, or the patience. I had to sew in my Home Ec. class and it was a horrible mess. I ended up sneakily taking the dress I was making home each night and my mother would sew it for me. But, I think the teacher was on to me. I am so sorry you’re so far from your mother. I was too, and how I wish I hadn’t moved so far and had stayed close. If I knew she’d die so soon, I would have done everything to have more time with her. My thoughts are the same everyday, Monica. Why did I move so far away from my mum, I wish I was closer. It takes 24hrs to travel to Sri Lanka and I wish she would come over here to be with us. She is very happy where she is and I don’t have the heart to ask her to make that move. When we lived in Australia she was quite happy there, I moved away and she wanted to go somewhere warm. We talk all the time but it isn’t the same. My mother sewed. She passed Sept 17 and we saved very few things, but among them was that sewing box. I suppose it was her wish as I must sew on a shirt button today. I have a 1912 Singer on my shelf. Carl, I’m sorry to hear about your mother. I think losing one’s mother can be the hardest thing. My mother, too, had a sewing box. It was a small round basket with a lid. I also have a plastic box with a handle on the lid, that is full of her spools of thread. A 1912 Singer. Wow. That was the year my father was born. This is a beautiful post! What an interesting life you have lived rich with memories, experiences and the love in every stitch, cut piece of cloth and design. You tug at my heart as my eyes fill with tears for the memories. haha I remember not asking my mother-in-law for a pair of scissors as I clipped something from the newspaper — I just helped myself to the scissors on her sewing table. “Please, not with my fabric shears!” she fairly called out. That’s when I learned there were scissors for cutting paper, and scissors for sewing. i must reiterate your other commenters as well — hugs for writing this and releasing such a beautiful tribute to your mother. Georgette, my mother’s sewing scissors were from Spain, given to her by one of my father’s brothers who traveled extensively. They were gold plated, with an elaborate design on them. I thought they were the most beautiful pair of scissors I’d ever seen. Sometimes she’d let me touch them, but they were exclusively used for sewing. Glad you enjoyed my story. Oh, I bet they were damascene scissors made in Toledo. Look at wp…it’s alerting me its a misspelled word. What does wp know? This morning as I sip coffee and read of your mother, I weep for you and your memories. Monica this is a lovely and moving tribute. I wish I could hug you right this minute. Instead I will just send you love. Val, thank you so much. Our ties were strong. I so appreciated all she did for us, sacrificed a lot, quietly living her life and dedicating it to caring for her children. I only wish I’d had more time with her. Sigh. Thanks, Jodi. If I can get any message across it’s to treasure your mom while you still can. Thanks for the hugs! Monica, since discovering your blog I have read most of the posts, but without doubt this is the best, your heart and soul are this post, and I reckon whilst you were writing it perhaps a few tears as well. I will admit it bought tears to my eyes, and me a grown man!! I reckon your mother was a special person and I would loved to have met her, to have talked to her and heard her story. The fact she was a special person is shown by how her daughter (You) turned out. Can I make a suggestion about the sewing machine, how about next time you have your children around you that you sit together and open that box and look at the machine that was and still is part of your mother. Who knows what else may be in there. Remember together your mother, their grandmother and not only all the good times but also the struggles and events that helped turn you into who you are. As I say it’s just a suggestion but I think it would be an experience for you to all share together. Have a great week Monica. Robert, thanks for the suggestion. My mother was special, but know that she was as special as most every other mother. She left too soon. I wasn’t ready and at times I feel robbed. And there you have it.